The Coronary Care Unit (CCU) or Telemetry Unit is a specialized unit for diverse patient population with acute or chronic cardiovascular diseases. 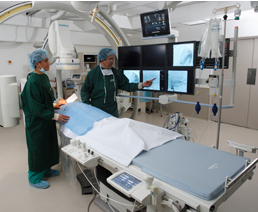 The Unit cares for patients with coronary syndromes, heart failure, and those who have undergone cardiac procedures such as angiogram. It caters to comprehensive cardiac monitoring and treatment of heart diseases under the care of a highly trained team of specialist doctors and nurses.